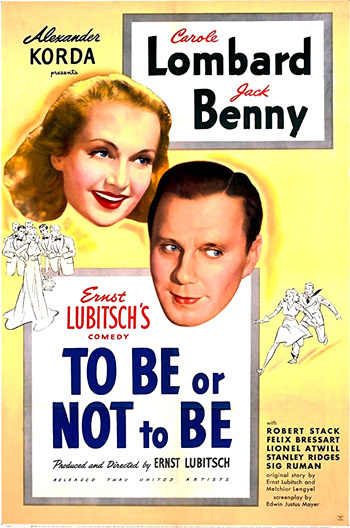 To Be or Not to Be (1942) is Berlin Germany-born director Ernst Lubitsch's sophisticated screwball masterpiece, with satirical comedy, romance, and suspense. The controversial anti-war comedy about espionage and politics from producer Alexander Korda - marked by incisive black humor - was a bold cinematic work during the World War II years that skewered and lampooned the tyrannical leader Adolf Hitler, the Nazis and the Third Reich, while still being completely entertaining in its story of marital conflict. Shortly before the film's release (during post-production), one of its stars, Hollywood's beloved Carole Lombard (blonde wife of Clark Gable), died at the age of 33 in a tragic airplane crash near Las Vegas on January 16, 1942. She was returning from a War Bond promotional tour. The script was developed both by Lubitsch and Hungarian writer Melchior Lengyel, whose original story was the basis for Lubitsch's previous film Ninotchka (1939) - the earlier film garnered Lengyel a Best Original Screenplay nomination (it lost to Gone With the Wind (1939)). Lubitsch's and Lengyel's comedic material was then put into script form by New York playwright Edwin Justus Mayer. Rudolph Maté's cinematography resembled his earlier Oscar-nominated work in another black and white WWII-era espionage-spy thriller, Hitchcock's Foreign Correspondent (1940). It was an historically-fearful time in late 1941 and early 1942 and audiences were not prone to easily accept a comedy at that time (e.g., the attack on Pearl Harbor, the Battle of Moscow (the German invasion of Russia on the Eastern Front), the torpedo-sinking of Britain’s Royal Navy aircraft carrier HMS Ark Royal by a German U-boat, deportations of thousands of Jews to concentration camps, the spread of Fascism over Europe, and Lombard's death). The title's "To Be or Not to Be" - Hamlet's existential contemplation of suicide in the play that resonated throughout the script, could have been rephrased as a decision-making assertion to ambivalent Americans: "To act or not to act." In the propagandistic anti-Nazi farce, the two stars (a theatrical couple) of a shabby, Polish Shakespearean acting troupe were introduced: the hilarious, egocentric Polish actor Joseph Tura (Jack Benny) and his flirtatious, zany blonde wife Maria (Carole Lombard). When their never-performed anti-Nazi play (titled Gestapo) was censored by the Nazi officials, the only production allowed was their continuing performances of Shakespeare's Hamlet. The main suspenseful plot, occurring during World War II in Nazi-occupied Warsaw, was a daring plan to help protect young Polish flier Lt. Stanislav Sobinski (Robert Stack) in the British RAF. The young fugitive pilot was madly in platonic, idolizing love with Joseph's beguiling wife Maria - it was a traditional romantic comedy love triangle. In an early continuing joke, the cuckolded husband cued the surreptitious lovers to privately rendezvous each night when he began Hamlet's famous soliloquy "To be or not to be" on-stage, and Sobinski noisily departed the theater's second row for a chaste tryst in her dressing room. The actors in the Polish troupe had to prevent Prof. Alexander Siletsky (Stanley Ridges), a traitorous imposter and Nazi spy sent from England, from delivering names of Resistance family members (of Polish airmen in the RAF) to the Gestapo. The performers became engaged in a complex plot to help the Resistance Underground by masquerading as the Gestapo, using the props and costumes from their production in order to outwit the Nazis, led by bumbling simpleton Nazi Colonel "Concentration Camp" Ehrhardt (Sig Ruman). Hammy and vain Joseph gave priceless imitations of Hamlet, Colonel Ehrhardt and Professor Siletsky and other disguises to fool the gullible Nazis. The marvelous farcical comedy - an effective example of political propaganda, received only one Academy Award nomination (among a total of 18 nominees! ): Best Musical Score (for a Drama or Comedy). The award was won by Austrian-American composer Max Steiner for the romantic drama Now, Voyager (1942). Neither of the two leads, hilarious comedian and radio star Jack Benny (in the most significant film of his career) or Carole Lombard received nominations - probably because the film was considered too insensitive, tasteless or offensive (and politically dangerous), or too close to home for homefront audiences. Two lines in particular were criticized - (1) the impersonated Colonel's callous joke: "We do the concentrating and the Poles do the camping," and (2) the Nazi Colonel's comment about poor acting: "As a matter of fact, I saw him [Joseph Tura] on the stage when I was in Warsaw, once before the war....What he did to Shakespeare we are doing now to Poland." Mel Brooks' Nazi-spoofing was right on target in the smash-hit The Producers (1967), especially in the memorable "Springtime for Hitler" sequence. However, the same director's remake To Be or Not to Be (1983) was a financial failure, often in bad taste and overacted in part, but moderately well-reviewed. A Broadway stage version, also titled To Be or Not to Be, opened in 2008 and played for only a few months. There were hints of Paul Verhoeven's Black Book (2006) (aka Zwartboek) and Quentin Tarantino's Inglourious Basterds (2009) in Lubitsch's masterwork. Just before the title screen, the principal performers, Carole Lombard and Jack Benny, were introduced with their names and a short visual clip. The credits were heard with Frédéric Chopin's 1938 Polonaise in A major, Op. 40, No. 1, 'Military'. Lubinski, Kubinski, Lominski, Rozanski & Poznanski. We're in Warsaw, the capital of Poland. It's August, 1939. Europe is still at peace. At the moment, life in Warsaw is going on as normally as ever. But suddenly, something seems to have happened. Are those Poles seeing a ghost? Why does this car suddenly stop? Everybody seems to be staring in one direction. People seem to be frightened, even terrified. Some flabbergasted. Can it be true? It must be true. No doubt. The man with the little mustache, Adolf Hitler. Adolf Hitler in Warsaw when the two countries are still at peace, and all by himself? He seems strangely unconcerned by all the excitement he's causing. Is he by any chance interested in Mr. Maslowski's delicatessen? That's impossible! He's a vegetarian. And yet, he doesn't always stick to his diet. Sometimes he swallows whole countries. Does he want to eat up Poland, too? Anyhow, how did he get here? What happened? Well, it all started in the General Headquarters of the Gestapo in Berlin. He said they named a brandy after Napoleon, and they made a herring out of Bismarck. And Hitler's going to end up as (a piece of cheese). Suddenly, the Fuhrer himself entered the office - to a chorus of numerous "Heil Hitler" salutes. The Hitler look-alike in a Nazi uniform saluted back: "Heil myself." Sitting at a desk on a theater's main stage, the strict producer Mr. Dobosh (Dobosz) (Charles Halton) stood up and reprimanded the actor playing the character of Hitler, a Polish actor named Bronski (Tom Dugan): "That's not in the script!" Disagreements arose amongst the various actors and the humorless producer. Bronski disagreed - he had purposely deviated from the script with his "Heil myself" line, and then told Dobosh: "But it'll get a laugh." One of the troupe's obviously-Jewish players, Mr. Greenberg (Felix Bressart), was not allowed to give his opinion. Further complaints were voiced by another actor named Rawitch (Lionel Atwill), playing the part of a Gestapo officer, who complained that there was a delay in his grand scene entrance. Greenberg retorted with an insult ("What you are, I wouldn't eat!") - inferring that Rawitch was an overacting "ham" actor, causing Rawitch to become outraged. He was interrupted by the slinky entrance of the theater's female star Maria Tura (Carole Lombard) wearing a tight, dazzling, floor-length, form-fitting satin gown: "Is that what you're going to wear in the concentration camp?" She thought it was an appropriate contrast to the grim conditions of a camp: "Think of me being flogged in the darkness. I scream, suddenly the lights go on, and the audience discovers me on the floor in this gorgeous dress." Dobosh vehemently disagreed with her costume proposal, and lost his temper: "That a great star, an artist, could be so inartistic. You must be out of your mind." Maria: Whenever I start to tell a story, you finish it. If I go on a diet, you lose the weight. If I have a cold, you cough. And if we should ever have a baby, I'm not so sure I'd be the mother. Joseph: I'm satisfied to be the father. Mr. Dobosh complained that Bronski's Hitler portrayal and his unbelievable costuming were unsatisfactory, and then told off the make-up man (Armand 'Curly' Wright) - "It's not convincing. To me, he's just a man with a little mustache." The crew member responded: "But so was Hitler." Dobosh added: "I just can't smell Hitler in him." Greenberg disagreed: "I can." Bronski defended himself: "I'm a nobody and I have to take a lot. But I know I look like Hitler, and I'm gonna prove it right now. I'm goin' out on the street and see what happens."